About two years ago we published a quick and easy guide to setting up your own RStudio server in the cloud using the Docker service and Digital Ocean. The process is incredibly easy-- about the only cumbersome part is retyping a random password. Today the excitement in virtual private servers is that Amazon is getting into the market, with their Lightsail product. They are not undercutting Digital Ocean entirely-- in fact, their prices look to be just about identical. But Amazon's interface may have some advantages for you, so here's how to get Docker and RStudio running with Amazon Lightsail. 4. Wait for boot up. Once it's running, click "connect" under the three dots. This opens a console window where you are already logged in, saving some headache vs. Digital Ocean. 5. Time for console commands. Type: sudo apt-get install docker.io Then Y for yes to add the new material. 8. Important! While the container is starting, go back to the Lightsail tab in your browser and click in the three dots in the "Running" instance to Manage. then click on the Networking tab. In the table of two enabled ports, click on the plus "Add Another". Leave "Custom" and "All" under "Aplication" and "Protocol", repectively, and change port range to 8787. Save. 9. The public IP is printed on the Networking page there. Cut and paste into your browser with :8787 appended. Your username and password are both rstudio, unless you changed them. To allow additional users onto your cloud server, see this page. An unrelated note about aggregators:We love aggregators! Aggregators collect blogs that have similar coverage for the convenience of readers, and for blog authors they offer a way to reach new audiences. SAS and R is aggregated by R-bloggers, PROC-X, and statsblogs with our permission, and by at least 2 other aggregating services which have never contacted us. If you read this on an aggregator that does not credit the blogs it incorporates, please come visit us at SAS and R. We answer comments there and offer direct subscriptions if you like our content. In addition, no one is allowed to profit by this work under our license; if you see advertisements on this page, the aggregator is violating the terms by which we publish our work, except as noted above. I've been working on a Shiny app and wanted to display some math equations. It's possible to use LaTeX to show math using MathJax, as shown in this example from the makers of Shiny. However, by default, MathJax does not allow in-line equations, because the dollar sign is used so frequently. But I needed to use in-line math in my application. Fortunately, the folks who make MathJax show how to enable the in-line equation mode, and the Shiny documentation shows how to write raw HTML. Here's how to do it. Here I replicated the code from the official Shiny example linked above. The magic code is inserted into ui.R, just below withMathJax(). Give it a try (or check out the Shiny app at https://r.amherst.edu/apps/nhorton/mathjax/)! One caveat is that the other means of in-line display, as shown in the official example, doesn't work when the MathJax HTML is inserted as above. In the US, it's typical to borrow a fairly substantial portion of the cost of a new house from a bank. The cost of these loans, the mortgage rate, varies over time depending on what the financial wizards see in their crystal balls. What this means over time is that when the mortgage rates go down, the cost of living in your own house magically decreases--you take a new loan at the lower rate and pay off your old loan with it-- then you only have to pay off the new loan at the lower rate. You can find mortgage rate calculators on the web very easily-- if you don't mind their collecting your data and being bombarded with ads if you let their cookies trace you. Instead, you can use SAS or R to calculate what you might pay for a new loan with various posted rates. There are some sophisticated tools available for either package if you're interested in the remaining principal or the proportion of each payment that's principal. Here, we just want to check the monthly payment. We'll begin by writing a little function to calculate the monthly payment from the principal, interest rate (in per cent), and term (in years) of the loan. This is basic stuff, but the code here is adapted from a function written by Thomas Girke of UC Riverside. To compare the monthly costs for a series of loans offered by a local bank, we'll input the bank's loans as a data frame. To save typing, we'll use the rep() function to generate the term of the loan and the points. In theory, each of these costs are fair, and the borrower should choose based on monthly costs they can afford, as well as whether they see a better value in having money in hand to spend on a better quality of life or to invest it in savings or in paying off their house sooner. Financial professionals often discuss things like the total dollars spent or the total spent on interest vs. principal, as well. The SAS/ETS package provides the LOAN procedure, which can calculate the detailed analyses mentioned above. For simple calculations like this one, we can use the mort function in the data step. It will find and return the missing one of the four parameters-- principal, payment, rate, and term. To enter the data in a manner similar to R, we'll use array statements and do loops. An unrelated note about aggregators:We love aggregators! Aggregators collect blogs that have similar coverage for the convenience of readers, and for blog authors they offer a way to reach new audiences. SAS and R is aggregated by R-bloggers, PROC-X, and statsblogs with our permission. If you read this on another aggregator that does not credit the blogs it incorporates, please come visit us at SAS and R. We answer comments there and offer direct subscriptions if you like our content. In addition, no one is allowed to profit by this work under our license; if you see advertisements on this page other than as noted above, the aggregator is violating the terms by which we publish our work. In 2012, we presented a post showing how to run RStudio in the cloud on an Amazon server. There were 7 steps, including one with 7 sub-steps, one of which had 6 sub-sub-steps. It was still pretty easy, for what it was-- an effectively free computer in the cloud to run R on. Today, we show the modern-- 3 years later!-- way to get the same result, only this approach is much easier, and the resulting installation includes all the best goodies of RStudio, including Markdown -> PDF and Hadley Wickham's packages pre-installed. Update, 2016: Digital ocean has changed their set-up, slightly. Check out the first step or two of this post in place of the first two steps below, if you're just starting out. The approach builds on Docker, an infrastructure that saves start-up time and overhead, as well as efforts led by Dirk Eddelbuettel and Carl Boettiger to develop a Docker application of R. This project is called Rocker, and interested readers are encouraged to read the details. But if you want to just get up and running, here are the simple steps to get going. 1. Go to Digital Ocean and sign up for an account. By using this link, you will get a $10 credit. (Full disclosure: Ken will also get a $25 credit once you spend $25 real dollars there.) The reason to use this provider is that they have a system ready to run with Docker already built in. In addition, their prices are quite reasonable. You will need to use a credit card or PayPal to activate your account, but you can play for a long time with your $10 credit-- the cheapest machine is $.007 per hour, up to a $5 per month maximum. 2. On your Digital Ocean page, click "Create droplet". Then choose an (arbitrary) name, a size (meaning cost/power) of machine, and the region closest to you. You can ignore the settings. Under "Select Image", choose the "Applications" tab and select "Docker (1.3.2 on 14.04)". (The numbers in the parentheses are the Docker and Ubuntu version, and might change over time.) Then click "Create Droplet" at the bottom of the page. 3. It takes about a minute for the machine to start up. When it's ready, click the "Console Access" button. This opens a text terminal to your Ubuntu machine, inside your web page. Press enter to get a prompt, and log in (your username is root) using the password that was sent to your e-mail. You'll have to change the password. you should see a bunch of messages about pulling and downloading, but eventually you will get the ">" prompt-- you can do R in here, but who would want to? But this is really not where you want to be. Instead, run the following command, to get a set-up that includes more useful packages installed in and with R.
5. Use it! The IP address of your server is displayed below the terminal where you typed in your docker command. Open a new browser tab and go to the address http://(ip address):8787. For example: http://135.104.92.185:8787. You'll see the RStudio login screen, and can enter "rstudio" (without the quotes) as the username and password. The system is well tuned enough that you can open a new file --> markdown --> PDF and immediately click "Knit PDF", and see the example document beautifully presented back to you in moments. That's it. It's still way cooler than sliced bread. let us know if you try it, and if you run into any trouble. Oh, and if you're feeling creeped out by the standard username and password in your RStudio, you can set them up from your docker command as follows. Other customization details and further information can be found on this Rocker page. I should perhaps have noted that what you are running here is in fact RStudio Server, and that you can allow additional users on your RStudio using instructions found here. Data with repeated measures often come to us in the "wide" format, as shown below for the HELP data set we use in our book. Here we show just an ID, the CESD depression measure from four follow-up assessments, plus the baseline CESD. 2     1     2       49         . In section 2.3.7 (2nd Edition) we discuss this problem, and we provide an example in section 7.10.9. Today we're adding a blog post to demonstrate some handy features in SAS and how the problem can be approached using plain R and, alternatively, using the new-ish R packages dplyr and tidyr, contributed by Hadley Wickham. We'll begin by making a narrower data frame with just the columns noted above. We use the select() function from the dplyr package to do this; the syntax is simply to provide the the name of the input data frame as the first argument and then the names of the columns to be included in the output data frame. We use this function instead of the similar base R function subset(..., select=) because of dplyr's useful starts_with() function. This operates on the column names as character vectors in a hopefully obvious way. Now we'll convert to the long format. The standard R approach is to use the reshape() function. The documentation for this is a bit of a slog, and the function can generate error messages that are not so helpful. But for simple problems like this one, it works well. In the preceding, the varying parameter is a list of columns which vary over time, while the id.var columns appear at each time. The v.names parameter is the name of the column which will hold the values of the varying variables. Another option would be to use base R knowledge to separate, rename, and then recombine the data as follows. The main hassle here is renaming the columns in each separate data frame so that they can be combined later. This is cumbersome, but effective. More interesting is to use the tools provided by dplyr and tidyr. The %>% operator is a "pipe" or "chain" operator that may be familiar if you're a *nix user. It feeds the result of the last function into the next function as the first argument. This can cut down on the use of nested parentheses and may make reading R code easier for some folks. The effect of the piping is that the mutate() function should be read as taking the result of the gather() as its input data frame, and sending its output data frame into the arrange() function. For Ken, the right assignment arrow (-> long) makes sense as a way to finish off this set of piping rules, but Nick and many R users would prefer to write this as long = gather... or long <- gather.. , etc. In SAS, we'll make the narrow data set using the keep statement in the data step, demonstrating meanwhile the convenient colon operator, that performs the same function provided by starts_with() in dplyr. The simpler way to make the desired data set is with the transpose procedure. Here the by statement forces the variables listed in that statement not to be transposed. The notsorted options save us having to actually sort the variables. Otherwise the procedure works like gather(): each transposed variable becomes a row in the output data set for every observation in the input data set. SAS uses standard variable names for gather()'s key (SAS: _NAME_)and value (SAS: COL1) though these can be changed. As with R, it's trivial, though somewhat cumbersome, to generate this effect using basic coding. 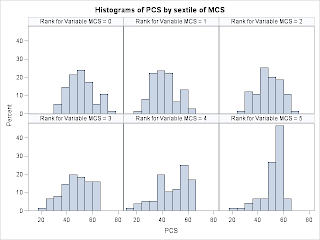 As we discuss in section 6.1.4 of the second edition, R and SAS handle categorical variables and their parameterization in models quite differently. SAS treats them on a procedure-by-procedure basis, which leads to some odd differences in capabilities and default parameterizations. For example, in the logistic procedure, the default is effect cell coding, while in the genmod procedure-- which also fits logistic regression-- the default is reference cell coding. Meanwhile, many procedures can only accommodate reference cell coding. In R, in contrast, categorical variables can be designated as "factors" and parameterization stored an attribute of the factor. In section 6.1.4, we demonstrate how the parameterization of a factor can be easily changed on the fly, in R, in lm(),glm(), and aov, using the contrasts= option in those functions. Here we show how to set the attribute more generally, for use in functions that don't accept the option. This post was inspired by a question from Julia Kuder, of Brigham and Women's Hospital. We begin by simulating censored survival data as in Example 7.30. 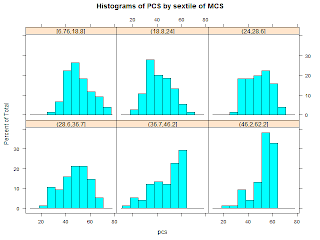 We'll also export the data to use in R.
Now we'll fit the data in SAS, using effect coding. We reproduce the rather unexciting results here for comparison with R.
In R we read the data in, then use the C() function to assign the contr.sum contrast to a version of the x1 variable that we save as a factor. Once that is done, we can fit the proportional hazards regression with the desired contrast. We excerpt the relevant output to demonstrate equivalence with SAS. In Example 8.40, side-by-side histograms, we showed how to generate histograms for some continuous variable, for each level of a categorical variable in a data set. An anonymous reader asked how we would do this if both the variables were continuous. Keep the questions coming! The SAS solution we presented relied on the sgpanel procedure. There, the panelby statement names a variable for which each distinct value will generate a panel. If there are many values, for example for a continuous variable, there will be many panels generated, which is probably not the desired result. As far as we know, there is no option to automatically categorize a continuous panel variable in proc sgpanel. If this is required, a two-step approach will be needed to first make groups of one of the variables. In this setting, the panels are another approach to the data we examine in a scatterplot. As an example, we show the mental compentency score by grouping of the physical competency score in the HELP data set. We also demonstrate the columns and rows options to the panelby statement, which allow control over the presentation of the panel results. The graphic produced is shown above. Our R solution in the earlier entry used the lattice package (written by Deepayan Sarkar) to plot a formula such as histogram(~a | b). A simple substitution of a continuous covariate b into that syntax will also generate a panel for each distinct value of the covariates: a factor is expected. In the package, an implementation of Trellis graphics, the term "shingles" is used to approach the notion of categorizing a continuous variable for making panels. The function equal.count() is provided to make the (possibly overlapping) categories of the variables, and uses the panel headers to suggest the ranges of continuous covariate that are included in each panel. Note that the default ordering of panels in lattice is left to right, bottom to top. The index.cond option here re-orders the panels to go from left to right, top to bottom. The default behavior of equal.count() is to allow some overlap between the categories, which is a little odd. In addition, there is a good deal of visual imprecision in the method used to identify the panels-- there's no key given, and the only indicator of the shingle value is the shading of the title bars. A more precise method would be to use the quantile() function manually, as we demonstrated in example 8.7, the Hosmer and Lemeshow goodness-of-fit test. We show here how the mutate() function in Hadley Wickham's dplyr package can be used to add a new variable to a data frame. This shows the exact values of the bin ranges in the panel titles, surely a better use of that space. Minor differences in the histograms are due to the overlapping categories included in the previous version. Finally, we also show the approach one might use with the ggplot2 package, an implementation of Leland Wilkinson's Grammar of Graphics, coded by Hadley Wickham. The package includes the useful cut_number() function, which does something similar to the cut(..., breaks=quantile(...)) construction we showed above. 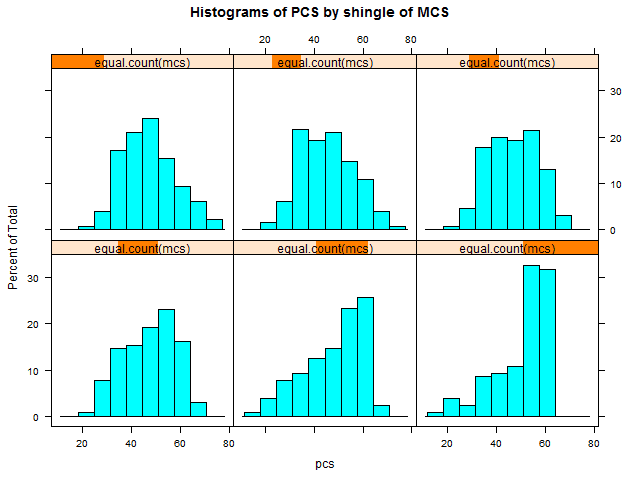 In ggplot2, "facets" are analogous to the shingles used in lattice. Example 2014.9: Rolling averages. Also: Second Edition is shipping! As of today, the second edition of "SAS and R: Data Management, Statistical Analysis, and Graphics" is shipping from CRC Press, Amazon, and other booksellers. There are lots of additional examples from this blog, new organization, and other features we hope you'll find useful. Thanks for your support. We'll be continuing to blog. Now, on to today's main course. For cyclical data, it's sometimes useful to generate rolling averages-- the average of some number of recent measurements, usually one full cycle. For example, for retail sales, one might want the rolling average of the most recent week. The rolling average will dampen the effects of repeated patterns but still show the location of the data. In keeping with our habit of plotting personal data (e.g.,Example 8.11, Example 8.12, example 10.1, Example 10.2), I'll use my own weight recorded over the past 6 months. After reading about "alternate day dieting" in The Atlantic, I decided to try the diet described in the book by Varady. I've never really tried to diet for weight loss before, but this diet has worked really well for me over the past six months. The basics are that you eat 500 calories every other day (diet days) and on the non-diet days you eat what you want. There's a little science supporting the approach. I can't really recommend the book, unfortunately, unless you're a fan of the self-help style. As you can imagine, one's weight tends to fluctuate pretty wildly between diet days and non-diet days. The cycle is just two days, but to get a sense of my weight at any given time, it might be best to use the rolling average of the past, say, four days. 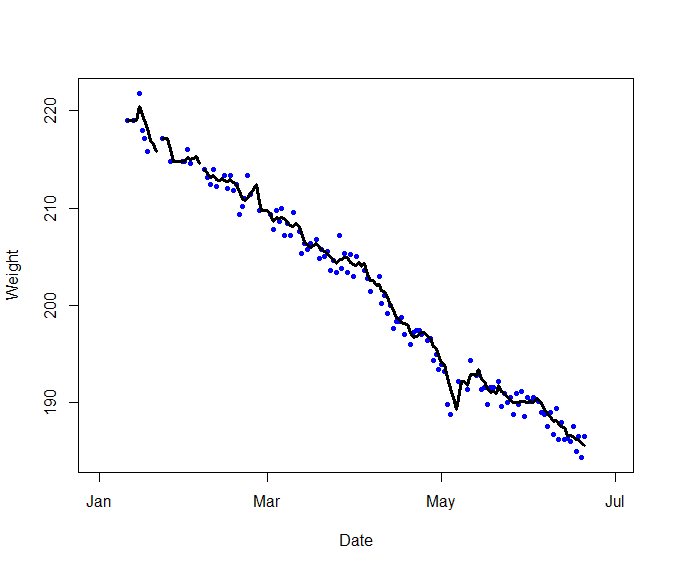 The beginning of the data, available from http://www.amherst.edu/~nhorton/sasr2/datasets/weight.txt, follows. As you can tell from the NAs, I compiled the data with the intent to read it into R.
Note, though, that the date values are just character strings (read in as a factor variable), and not so useful as read in. The lubridate package contributed by the invaluable Hadley Wickham contains functions to make it easier to use dates in R. Here, I use its mdy() function to convert characters values into R dates. 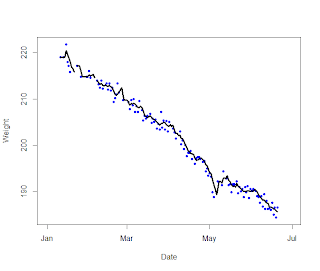 The simple plot has enough values that you can clearly see the trend of weight loss over time, and perhaps the rolling average exercise is somewhat misplaced, here. To calculate the rolling average, I adapted (below) the lag function from section 2.2.18 (2nd edition; 1.4.17 in the 1st ed.) -- this is a simpler version that does not check for errors. The result of lag(x,k) is a vector with the first k values missing and with the remaining values being the beginning values of x. Thus the ith value of lag(x,k) is x[i-k]. To get the rolling average, I just take the mean of several lags. Here I use the rowMeans() function to do it for all the values at once. The lines() function adds the rolling average to the plot. The final plot is shown above. Note that the the initial values of the lagged vector are missing, as are weights for several dates throughout this period. The na.rm=T option causes rowMeans() to return the mean of the observed values-- equivalent to a single imputation of the mean of the observed values, which perhaps Nick will allow me in this setting (note from NH: I don't have major issues with this). There are also two periods where I failed to record weights for four days running. For these periods, rowMeans() returns NaN, or "Not a Number". This is usefully converted to regions in the plot where the running average line is not plotted. Compare, for instance, with the default SAS behavior shown below. For the record, I was ill in early May and had little appetite regardless of my dieting schedule. The data can be easily read with the input statement. The mmddyy7. informat tells SAS that the data in the first field are as many as 7 characters long and should be read as dates. SAS will store them as SAS dates (section 2.4 in the 2nd edition; 1.6 in the 1st edition). As the data are read in, I use the lagk functions (section 2.2.18 2nd edition; 1.4.17 in the 1st ed.) to recall the values from recent days and calculate the rolling average as I go. Note that the input statement expects the weight values to be numbers, and interprets the NAs in the data as "Invalid data". It inserts missing values into the data set, which is what we desire. The mean function provides the mean of the non-missing values. When the weight and all of the lagged values of weight are missing, it will return a missing value. With the rolling average in hand, I can plot the observed weights and the rolling average. To print Julian dates rather than SAS dates, use the format statement to tell SAS that the date variable should be printed using the date. format. The results are shown below. The main difference from the R plot is that the gaps in my recording do not appear in the line. The SAS symbol statement, the equivalent of the lines() function, more or less, does not encounter NaNs, but only missing values, and so it connects the points. I think R's behavior is more appropriate here-- there's no particular reason to suppose a linear interpolation between the observed data points is best, and so the line ought to be missing.